The time has come—Millennials are ready for car ownership. They're past their college years, getting married, earning good salaries, and considering moves outside of urban areas. If you're an automotive marketer and still think of Millennials as teens who only use ride-sharing services, this Placed Research study is for you. By integrating Placed's large-scale business visitation data with 1st-party automotive shopping surveys, we validated that Millennials are shopping at dealerships and taking test drives. 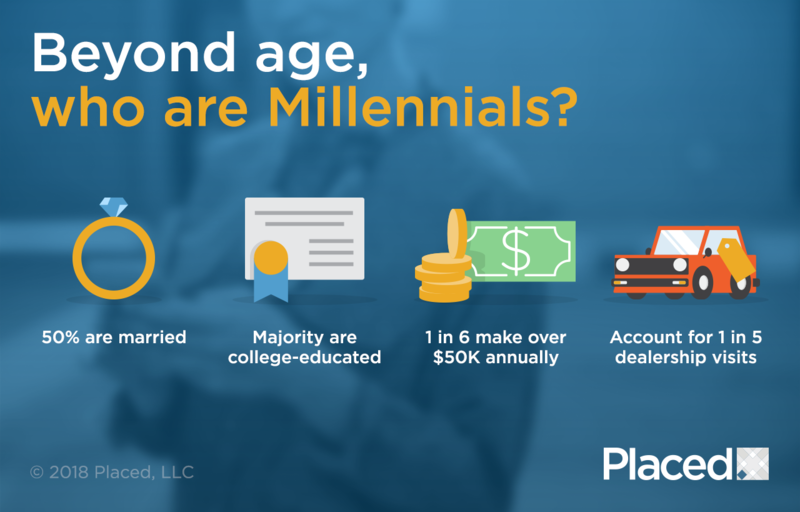 According to population projections from the U.S. Census Bureau, Millennials are on the cusp of surpassing Baby Boomers as the nation's largest living adult generation. Leveraging location analytics will prepare you to effectively reach the Millennial market. Placed Insights - Placed Insights is a comprehensive foot traffic measurement solution. In addition to providing census-level estimates of foot traffic patterns, this tool allows for custom segments to be created and indexed against broader behavior. Supporting this functionality is Placed's 1st Party Audience, which includes users providing 4 billion monthly location signals. Placed Surveys - On a daily basis, Placed sends in-app surveys to panelists with potential automotive visits. Once an automotive visit is confirmed, the panelist is then requested to indicate the purpose of the visit (e.g., shopping, parts & service, etc). For this analysis, more than 20,000 surveys were used to create custom automotive shopping segments within Placed Insights. By comparing the behavior of confirmed automotive intent to the broader population, indexes were constructed to drive the analysis described in this paper. To learn about the methodology used to identify auto shopping visits and test drive visits, download the Placed technical white paper: Determining Consumer Intent for Automotive Dealership Visits.